Cattleya orchid on display at Grogan's lecture. Often found in Central and South America, cattleya orchids have a bulb at the base of the leaf which is thick and solid. The leaves are succulent, which makes it highly adaptable to being dry. 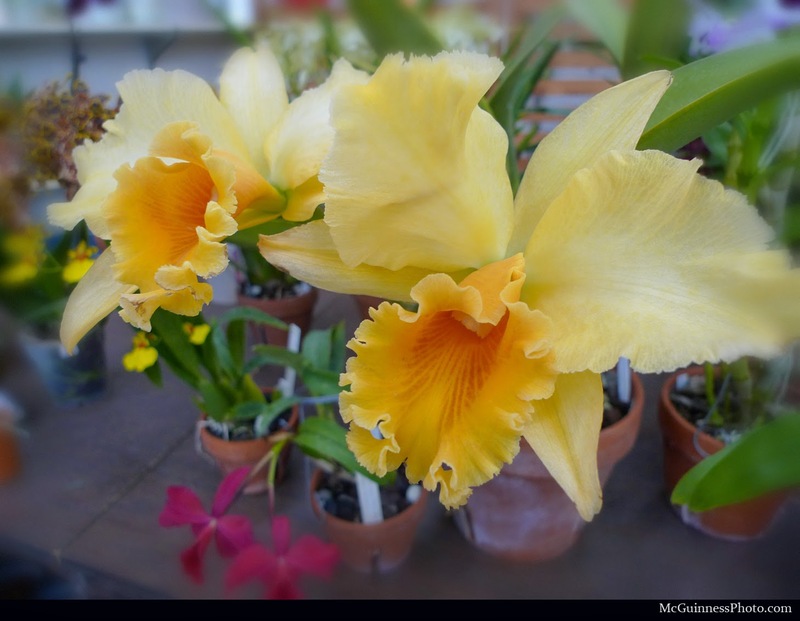 Grogan said cattleya orchids are often from seasonally dry forests that have a dry season and rainy season - like cacti. "They are adapted to going weeks, if not months, without any water at all," he said. "But when it's wet, they want to be wet, almost on a daily basis." "They want high light, coarse medium and lots of water in the summertime and lots of fertilizer," he said. He waters them less in the wintertime but does not leave them completely dry. The bright yellow flower is an example of an oncidium orchid. With thin and flexible leaves, they have flatter bulbs and are not as succulent as cattleyas. They need wetter conditions than cattleyas. "It means this is an orchid that grows in a wetter environment where it comes from and it needs more consistent moisture than the cattleya," Grogan said. presentation at Hadley Garden Center. Also known as cane orchids, dendrobriums originate in southeast Asia, Australia, Papaya and New Guinea. They come from seasonally dry environments. According to Grogan, during our (American) growing season, they need to be very wet with lots of hard lighting. But then they need to be dry for two to three months during our winter. If they get that treatment, they know to drop their leaves and set their flower buds, he said. Cymbidium orchids are heavy feeders of fertilizer. 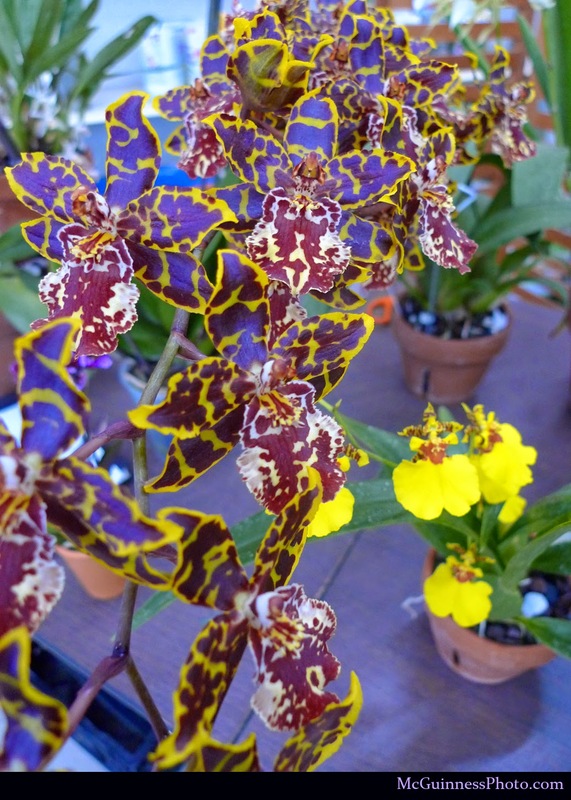 "These are cold growers and high-light orchids," Grogan said. "In the wintertime they want to be in a cool space, and they want to be wet almost all year round, so I water these pretty heavily, especially during the summertime during the growing season. You need a lot of fertilizer to make that many flowers." 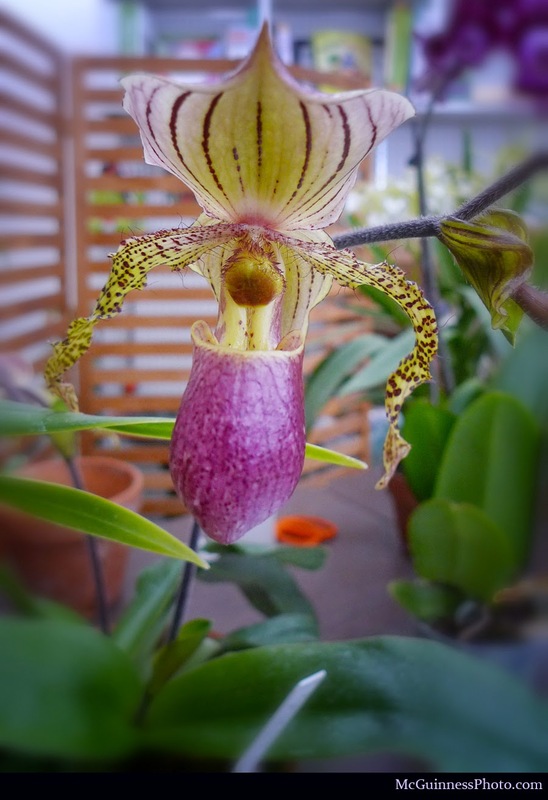 An old world lady slipper from the Mount Holyoke College collection. A new world lady slipper. The lady slippers that most people grow in homes are old world, or Asian, lady slippers. They can be found in southeast Asia and southern China or the Himalayans. "It's not succulent. It's a ground orchid but it comes from a wetter environment and it doesn't have to store water and worry about being seasonally dry," he said. They need to be watered very regularly all year round. These are low-light orchids. The new world lady slipper orchids also want to be wet all the time but are high light orchids. There are no holes on the side of their pots so the medium stays wetter longer, he said. They also want potting medium changed every year, he said. 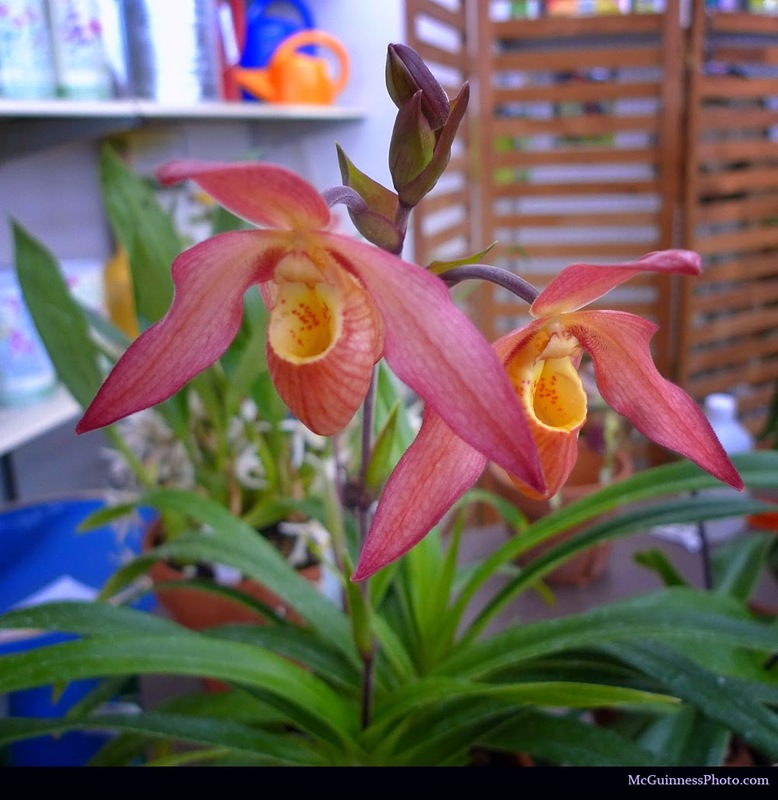 Grogan recommended reading "Understanding Orchids" by William Cullina for more information on growing orchids. 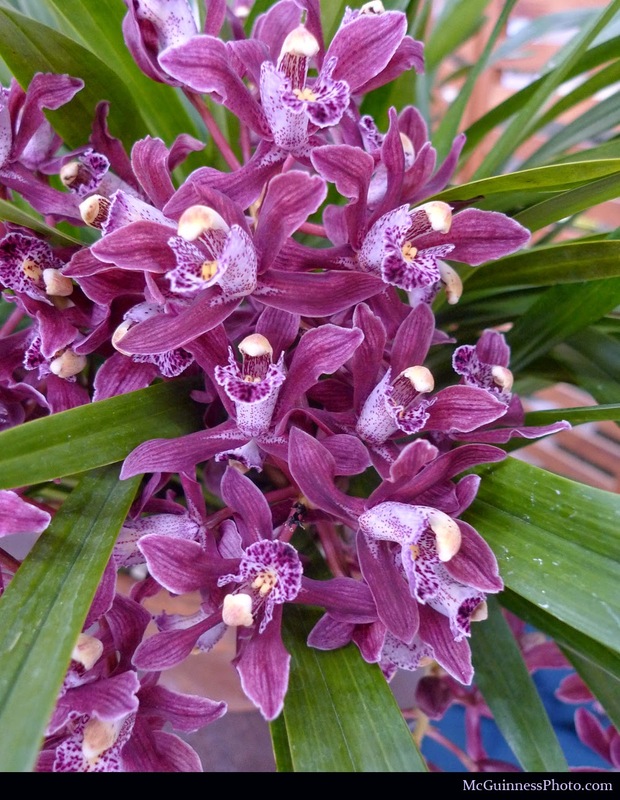 He also highly recommended OrchidSpecies.com. "Any orchid you have a name of, you will find a photo of it's flowers. It's a really great resource. I use it all the time to check things." 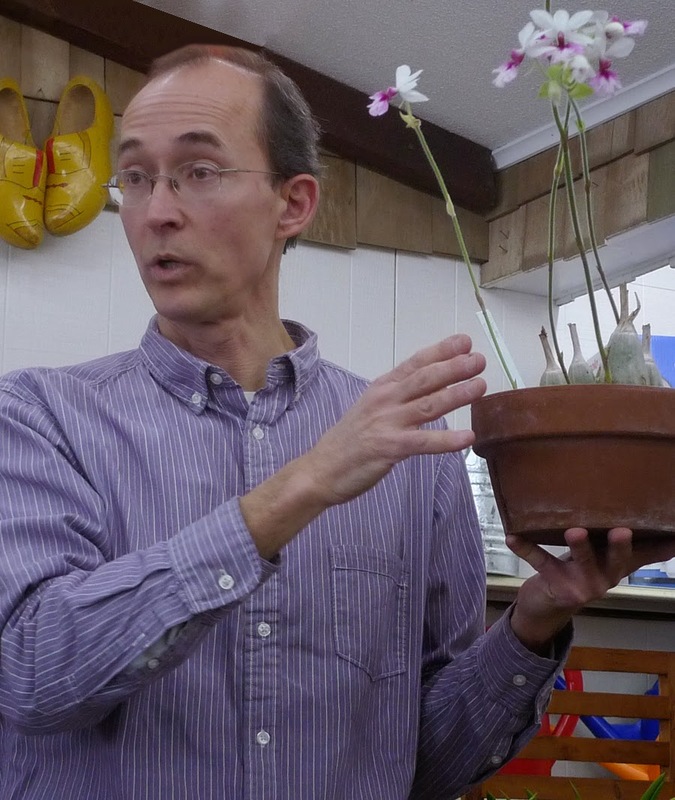 Grogan's lecture was part of the free winter gardening clinic series held at Hadley Garden Center.